For some people a little background noise is helpful. Others require complete silence in order to get work done, according to Marla Ahlgrimm. Q: Is noise a reason it’s so hard to work at my peak every day? Marla Ahlgrimm: It can be, depending on the person. 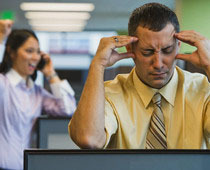 When trying to work or do any task that requires a higher level of focus, noise can cause an incredible distraction. Some people are more sensitive to noise than others. Q: In general, how do distractions affect our work? Marla Ahlgrimm: When you lose your place in a thought because of a distraction, it takes some time to go back and re-focus. Every time you’re distracted, it takes quite a lot of energy to get back on track. This effort can become quite exhausting. Q: What’s the optimal environment for people to work in, in your opinion? Marla Ahlgrimm: There isn’t one optimal environment. It changes across the day, across the week... There are times when we need to be able to completely shut out the world and not be distracted at all. But there are times when we want and need to work around other people. Q: How can I create a quieter atmosphere at work? Marla Ahlgrimm: Depending on your job, there are ways to minimize the negative effect noise has on your performance and health and maximize all the beneficial things a quiet atmosphere can bring. Noise cancelling headphones, for example, are a great solution to noise reduction. Q: What if headphones aren’t an option at my workplace? Marla Ahlgrimm: If your workplace is the main source of unrelenting and constant noise, you may just need to talk to your boss. Simply let him or her know how the noise in the office makes it difficult to focus on work and be productive throughout the day. See if a compromise can be worked out that will be acceptable to both you as the employee, and management.